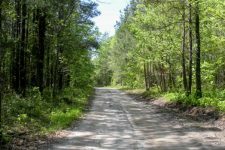 Seventy years ago there stood, near what is now the home of Mr. John Brabham about four miles southeast of Perote on the Richardson’s Bridge road, a log house which was used for a place of worship. 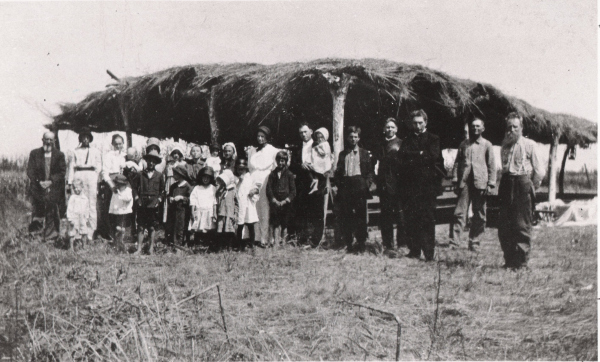 As the building was not sufficiently large to accommodate the crowd that came for many miles and as there were no sawmills convenient, a bush arbor was added. 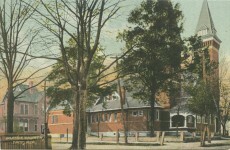 From this the house became known as Bush Arbor Church. Later a more euphoneous (sic) name was bestowed. It was referred to as Mount Olivet. We are indebted for our earliest information to our friends Mr. Jim McLaney of Union Springs and Mr. Miles Richardson of Perote. 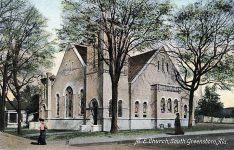 These reliable men resided with their parents in the neighborhood of this first Methodist Church established in this section of the country. They were boys together and we quote from their interesting accounts of early days. 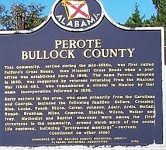 Mr. McLaney says: “In the early days of that section known as Pike County (now Bullock) the citizens built a large log house to worship in. They also used it for a school house. This church was known as Bush Arbor and was standing there when my parents moved to that section in 1839. I attended school and often went to preaching there. Opposite the church, across the road, was a graveyard. Many people were buried there, one of whom was a local Methodist preacher named Holley. His wife, known as Mother Holley was a fine old lady whom everybody loved. She helped along all good meetings by shouting. The Holley’s were cultured people and Mr. Holley was one of the best men who preached in the old church and at the Pike County meeting. 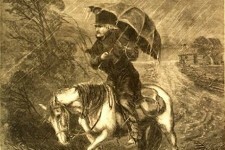 There were few roads through the country at that time and my father often put me behind the preacher on horseback and sent me to point out the way to another charge. I remember on one occasion Mr. Abram Miles read from a paper the appointments and when it was learned that Rev. Olin Capers had been assigned to that Circuit many of the members expressed their pleasure by cheering. Mr. Capers was a nephew of Bishop Capers and had few equals as a pulpit orator’ This about the year 1849. Mr. Richardson says: “My father, Stephen Richardson, was a class leader in this church of which both he and my mother were members. The good old Mr. Holley always wore a long gown when he preached, the first I ever saw. Among those who often preached that were not supplied by conference were Rev. Barker, father of Mrs. Jim Stuckey, one Adams about the year 1840, and J. Mellard or Marrard. The last mentioned was a superanuated (sic) minister who is said in early manhood to have preached the first sermon ever delivered in Montgomery, Alabama. 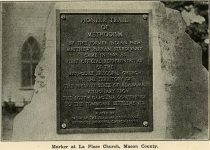 Some of the prominent members of this church were Bryant Lane and wife, and a family by the name of McLean, which consisted of eight members, five of whom were blind. They were deeply pious people, never missing a service if possible to be present. Mr, and Mrs. McCall, parents of Mrs. William Crossley, Mr. Abram Miles, with his son T, B. Miles, and his stepchildren, the Crossleys with their consecrated cousin Caroline Godfrey. 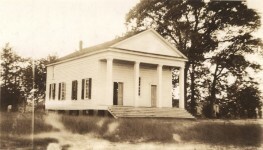 Presiding Elders of the Irvinton (Eufaula) District 1835-1836, J. Boswell; 1837-1838 E. Hearne; 1839-1840 Green Malone; 1841, Noah Laney; 1842-1843, Thomas Lynch. The name was changed to Eufaula that year. Presiding Elders of the Eufaula District 1844-1845, Thoas. Lynch; 1846-1847-1848, J. C. Carter; 1849, S. Amstrong. In 1845 the Enon Circuit was formed. 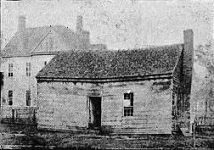 Enon Circuit, preacher in charge: 1844, James Peeler; 1845 S. Armstrong, T. M. Lynch; 1846, S. Armstrong, N. P. Scales; 1847, Samuel Armstrong, T. M. Lynch; 1848 John L. Saunders, J. L. Pierce; 1849, John L. Saunders, W. L. Kidd. 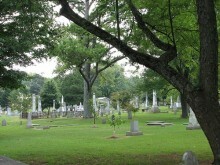 Have you ever had a ghost experience at Bass Cemetery Irondale, Alabama? That’s a real brusharbor meeting..